You’ve had your horse for a few years and have a great partnership with him, but do you really know him? Horses communicate to other horses and humans with their body language, which can sometimes be misinterpreted by horse owners. A certain look, flick of the ears or swish of the tail all mean something, if we just learn to understand what they’re trying to communicate. With keen observation, time and patience, you can learn to read your horse. Horses are herd animals, so a good first step is simply watching your horse when he’s in a small field or pasture with other horses and observing their interactions. Pay attention to how your horse spends time with the other horses. Is he grazing together with another horse, engaging in mutual grooming (nibbling each other’s withers or back) or standing head to tail to help each other with fly control? These behaviors can show you who your horse gets along with best. Of course dramatic moments can occur, too, which can tell you where your horse lies in the pecking order. Every herd has a dominant horse and several submissive horses, who will always give up their space and/or food to the dominant horse. A tucked tail, pinned ears, squeal and a two-barreled kick can be clearly interpreted as a show of dominance or simply a warning to “back off.” These are often just quick squabbles, but if your horse consistently takes aim at or runs from a certain horse, you may want to move him to a different pasture with a new group of horses. 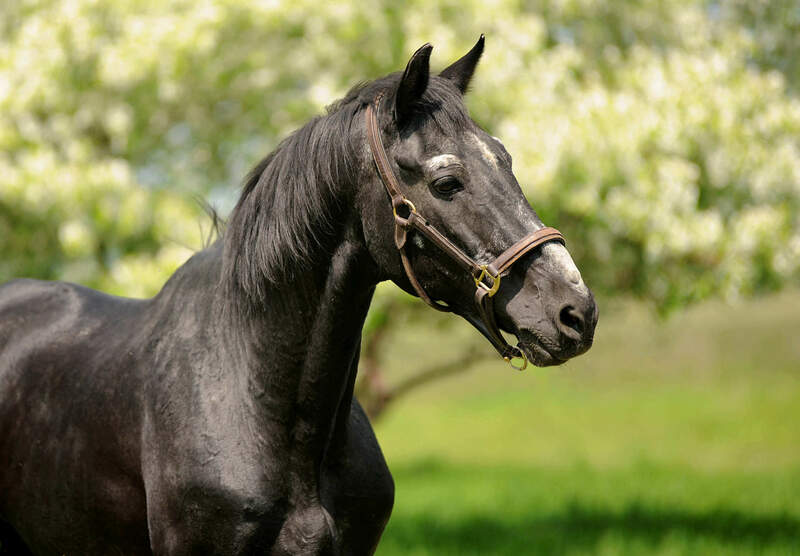 Another good time to observe your horse is when he’s alone in his stall or a small paddock. Obviously, horses can’t talk to us using words, but their body language and actions are often very clear indicators of what they’re saying. A horse’s ears, mouth and tail are key components in interpreting his body language. A horse’s ears are quite active, always moving around to catch sounds that may mean danger. When their ears are pricked forward, it means that they’re interested in something and is a positive form of curiosity. When they’re pinned back against their head, it generally means that they’re angry and could signal a warning to “stay away.” If a horse’s ears are to the side while riding, it means he’s paying attention to what the rider’s asking. If your horse is standing quietly with his ears slightly loose and flopped to the side along with a drooping lower lip, he is very relaxed or possibly sleeping. Make sure to warn a horse who’s in this “relaxed” posture when you approach – he may be unaware of his surroundings. Your horse’s mouth can also signify different moods. A loose, drooped lip indicates your horse is relaxed, and may even be snoozing. A raised upper lip is called a “flehmen” response. Horses do this to draw in scents through the vomeronasal organ on the roof of their mouth. It mostly occurs when a stallion is checking if a mare is in heat, or you might see a mare show a flehmen response during the initial hours after birth to smell the newborn foal, but any horse may do this to check out an interesting scent. 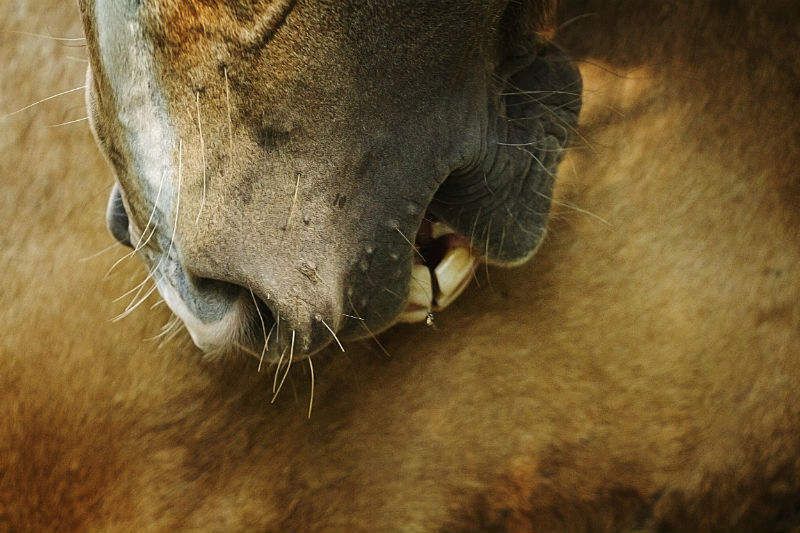 There are some actions that may look like the flehmen response, but are actually a curling of the lip, which can signify gastrointestinal discomfort. If you notice your horse doing this and it’s out of his normal behavior, contact your veterinarian. If your horse’s lips are drawn back and his teeth are showing, it’s a prelude to lunging or biting. Don’t disregard this warning! Flared nostrils tend to mean an excited horse. Be prepared if you are leading or riding your horse when this happens! Things could get interesting very quickly. Your horse’s tail is another guide to his emotions. When a horse is relaxed, his tail hangs down loosely; it “looks” relaxed. If the tail is tucked, your horse may be planning to bolt or kick at something or someone who’s bothering him. When working, a happy horse’s tail will hang loosely and swing a bit. Wringing of the tail tends to mean irritation or resistance. There may be physical discomfort or your horse may not like the work he is being asked to do. Either way, you need to heed his warning and take some corrective action. A raised tail is often a sign of high excitement or just feeling great. Young horses, or horses with excess energy, galloping freely in a field often hoist their tails high to show their exuberance. Horses that are spooked or frightened of something will also “flag” their tails, and mares in heat may raise their tails or flick it to one side to indicate she’s ready to mate. Although noticing these signals will hardly make you an equine mind reader, it will help you to understand how your horse may be feeling. For any horse, learning to read behavior will make you a better team. With time and practice, you will do this without any conscious thought. And at the same time, your horse will be reading your mood and behavior!